When fairly comparing total "well-to-wheels" greenhouse gas emissions (GHGs) and well-to-wheels fuel efficiencies of fuel cell electric vehicles (FCEVs) and battery electric vehicles (BEVs), FCEVs come out "greener" than BEVs, in most scenarios. Specifically, FCEVs emit fewer GHGs, and consume less energy, than BEVs do when compared over the same 300-mile range on a well-to-wheels basis, most of the time. But you wouldn't know that from reading the press coverage of the two technologies; in fact, you would think just the opposite. The problem involves editors allowing verbatim repetition of summarized conclusions of industry-sponsored research - which seems to contain unfair, apples-to-oranges judgments - without analyzing the data used, or the assumptions made. The most flagrant of these unfair comparisons has involved using different ranges (miles driven) when comparing the well-to-wheels emissions of each type of vehicle. Specifically, some studies have used a 100-mile range for BEVs while using a 300-mile range for FCEVs, when comparing the amount of GHGs the cars produce. Unsurprisingly, driving 200 more miles produces higher emissions for FCEVs, and thus garners "greener" results in favor of BEVs. But comparing GHGs and energy consumption fairly requires 1. ), using the same competitive maximum ranges, and 2. ), demands inputting the actual or real-world energy sources these vehicles use to roll their wheels down the road. 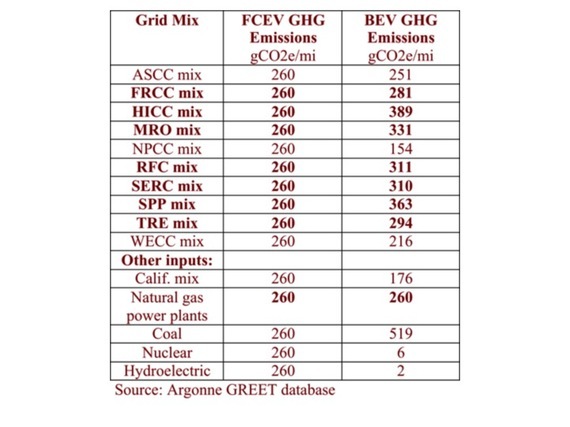 When one does so using the latest Argonne National Laboratory "GREET" data - the scientific authority on emissions and energy impacts of new transport fuels - FCEVs come out greener and more energy efficient, most of the time. The chart below compares emissions of FCEVs and BEVs over the same 300-mile range, based on real-world energy consumption. The FCEV energy input is steam methane reforming of natural gas, which is how nearly all gaseous hydrogen is produced today. 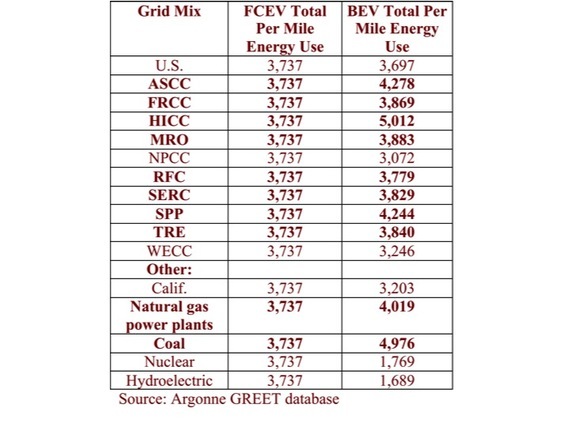 The sources for BEVs include the overall U.S grid mix (coal, natural gas, nuclear, etc.) as well as the regional mixes of electricity production that power the grid wherever BEVs plug in. Note: The U.S. grid is parsed by regional councils, roughly equating geographically with Alaska (ASCC); Florida (FRCC); Hawaii (HICC); western Midwest (MRO); Northeast (NPCC); eastern Midwest and southern Mid-Atlantic (RFC); the South (SERC); Southern Great Plains (SPP); Texas (TRE); and the West (WECC). Current data shows FCEVs emit less GHGs than BEVs, across most of the country. BEV GHGs depend on the specific grid mix the cars plug into, and those levels change according to what energy sources power the grids in towns with charging stations. For instance, BEVs tend to be the greener ZEV option currently versus FCEVs in some parts of the Northeast, because a cleaner energy mix - natural gas and nuclear power - generate significant portions of electricity in Connecticut, New York, New Jersey and New Hampshire. Maine is mostly powered by renewables, natural gas and hydroelectric sources; while Vermont is hydro- and renewables-powered. But as soon as wheels roll into Maryland, Pennsylvania or Delaware - or almost anywhere else besides the West Coast, Alaska, Idaho or Nevada - BEVs plug into coal country, making FCEVs the greener ZEV option. That can also be the case along Connecticut's Gold Coast; near Cape Cod, Mass. ; Jersey City, N.J.; Western New York; or Portsmouth, N.H., where recharging stations are still partially coal-powered. Grids do not significantly impact FCEV GHGs (which is why above, they're all 260) because hydrogen is now made almost exclusively from natural gas. But as both electricity and hydrogen sourcing shifts to renewable production, such as from wind and solar, or via other methods like nuclear, hydroelectric or geothermal, FCEVs and BEVs should show very low, nearly matching GHGs. ZEVs will then be competing more on traditional characteristics like range, power, maintenance, style and handling. They're already virtually tied in GHGs when their fuels are fed solely from natural gas. So places like Rhode Island, which is nearly all natural gas-powered, could be a uniquely competitive ZEV market. Note the numbers shown are not static: They're meant to give a sense of energy possibilities for both types of ZEV. Some reports have compared BEVs that plug into only the California grid - which leads the nation in renewable energy production but is of course not the only place where electric cars recharge - against a source of hydrogen like water electrolysis: Although renewably powered, electrolysis has yet to be fully commercialized because scientists are still working on how to make "splitting water" - separating the hydrogen from the oxygen in H2O - more efficient. Electrolyzing currently requires a lot of energy. But scientists are halfway toward a breakthrough that would change that. Studies sourcing liquid hydrogen have also skewed FCEV GHGs higher, even though the vast majority of hydrogen produced is gaseous, and nearly all FCEVs use H2 gas to fill their tanks. The chart below compares total well-to-wheels energy consumption, which scientists consider the truest, most complete fuel efficiency gauge: U.S. miles per gallon, and mpg-equivalents, only measure tank-to-wheels efficiencies.